HARE Polish: Love You To Pieces! In continuing with my ‘pictures I wanted to post before Valentine’s Day’ promise, today I have a beauty from HARE Polish, Love You To Pieces! The minute pictures were posted of this polish, I knew I had to have it. It’s a beautiful plum purple jelly polish filled to the brim with different colored flakies! What’s not to love? Application was great- everything went on smooth and easily. Photos show 2 coats plus topcoat. And since these are flakies and not glitter, removal was a breeze! You can find this beauty and more amazing colors are Hare Polish on Etsy and also at Llarowe! It took a lot of willpower to walk away with only this shade during her most recent restock- there were other new beautiful colors released! For updates on new colors and restock dates, you can follow Hare Polish on Facebook and also at harepolish.com. Good evening everyone! 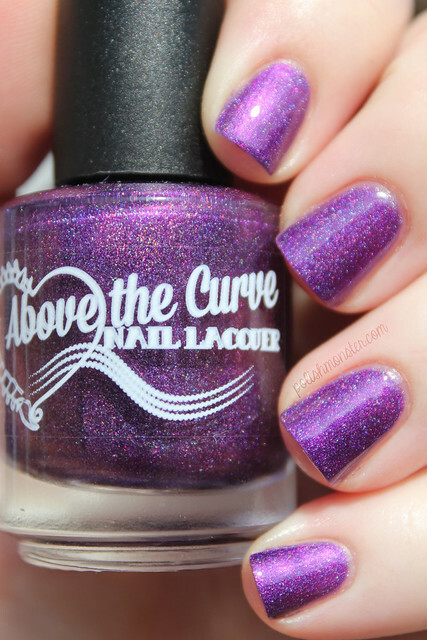 Tonight I have another Above the Curve post for you- and it’s an awesome one! Earlier tonight, the always amazing Above the Curve released Part 1 of their Doctor Who Inspired collection! I am a HUGE Doctor Who fan, so I jumped at the chance to show these beauties off to you all 🙂 And they did not disappoint! Each one applied wonderfully and are just so beautiful! I used KBShimmer Clearly on Top topcoat for each photo (when I just say ‘topcoat’). The first polish of the collection is Donna. Donna Noble is one of my very favorite companions featured in the newer shows, and so I just love that she gets her own polish in this collection. This polish definitely reminds me of her bright, red hair as well as her tough, stubborn attitude! Donna the polish is a reddish orange polish filled with a faint scattered holo. I used 2 coats and topcoat for these photos. The Slitheen are (or were?) a family of criminals from the planet Raxacoricofallapatorius that hide their true forms while on Earth by ‘wearing’ the skins of humans- and tend to be very gassy as a result of the compression! This color is really special, and my photos aren’t really doing it justice. It’s a pretty, evergreen polish with a bit of a gold/brown shift to it, and a green glow. Like Donna, it has a scattered holographic finish. I used 2 coats and topcoat for these pictures. Next in the set is Relative Dimensions! The Doctor’s TARDIS, the big blue police box most people see in Who related photos, stands for Time And Relative Dimension In Space. He is able to travel to any place, and any time in the universe. Relative Dimensions is really really beautiful out in the sunlight. It appears a bit brighter out in the sun than it does indoors- inside it’s a bit more of a muted purple, but both inside and outside it’s just lovely. It also really brings out the red and purple sparks that are in there! It almost looked like micro-micro glitter 🙂 Like the others in the collection, this also sports a scattered holo effect. Shown is 2 coats with topcoat. And last but not least, we have my favorite of the collection- The Silence! This is a gorgeous dark polish- in some lights it appears black, but there’s a definite blue to purple shift in there that’s subtle but not hidden. It’s also full of micro flakes and a scattered holo like the rest of the collection. It feels like there’s a galaxy on your nails without doing anything but painting them! That was my first thought when I got outside and stared at this color. A definite must have! 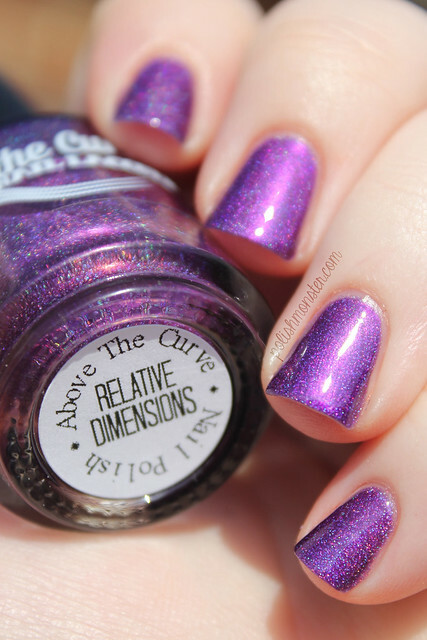 You can find Above the Curve polishes in their Big Cartel store, and also at Overall Beauty. These beauties were launched TONIGHT on the Big Cartel page, so go get them now! They are each priced at $8.50, which is a steal! You can follow the ATC Facebook page and ATC on Instagram for news and updates. Don’t forget, $1 from every bottle is donated to Shriner’s Hospitals for Children! For further information on what Above the Curve is supporting, please visit these websites to learn more: http://www.shrinershq.org/ and http://www.scoliosis.org/. I’m a new convert to CbL’s- I resisted for awhile (I have so many polishes, I usually wait to try new brands until there’s something I just can’t live without)- and that ‘can’t live without’ polish came when I saw pictures of Precious Metal. I got a few- fell in love- got a few more- and now I’m hooked! I don’t have a ton yet, but every single one of these is absolutely amazing. I don’t say this lightly- these are some of the nicest polishes I own. Not that I’m an expert, but at over 1,000 polishes- that’s saying quite a bit. Every single one has blown my mind with it’s beauty. Every single one applies like an absolute dream. The 2 shimmer polishes were a touch thicker than their holographic sisters, but still applied great. 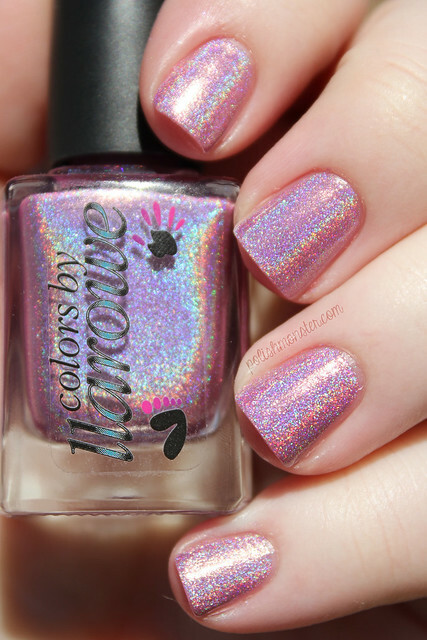 Many of the holographic polishes are opaque in 1 coat. 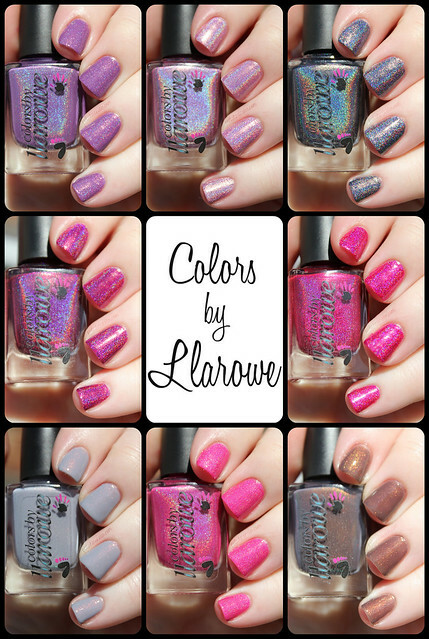 There’s some in the lineup that aren’t quite my cup of tea, but I don’t think I’ve seen anything from Colors by Llarowe that isn’t pretty. First up is Smoke Gets In Your Eyes, which was (sadly) a Limited Edition polish that came out alongside the Valentine’s Day polishes. It is a simply stunning brown jelly filled with an intense gold to red to green shimmer. I adore this polish on looks alone, but the name really gets me. I love the Platters- I grew up listening to their music because my mom and my grandma played it constantly. I can’t think of any of their songs without thinking of my Grandma’s house, because I’m fairly confident it’s all she ever played (or rather- I don’t remember anything else!. I miss her so much- so this makes me think of her and therefore I love it :). I saw that one of the upcoming polishes is called The Great Pretender- which I plan on getting regardless of what it looks like! Next is Sparkles Are a Girls Best Friend! This is a stunning, bright pink holographic polish filled with purple flash and extra sparkle. It’s SO bright and fun! The polish that started my collection- Precious Metal. Precious Metal is a cool, blue toned grey polish filled with an orange shimmer that is noticable even indoors, though never blinding. I find myself staring at my nails every time I use this one! Next we have Dirty Diana! I confess, I did buy this one 90% for the name. But I am SO glad I did! Dirty Diana is a beautiful magenta strong holographic polish. When I’ve worn this on ‘normal’ days (and not taking photos), I only use 1 coat! This was beautiful inside, as well as outside in the sun. This pretty purple polish is Tank Tops and Flip Flops. I believe Tank Tops and Flip Flops is retired- but keep your eyes open at blog sales, I occasionally see it pop up! This is a beautiful muted violet holographic polish. Just gorgeous! Next is another of my very favorites- It’s Shocking! It’s Shocking! is a bright, hot pink holographic polish with a bit of a blurple sheen. SO bright and pretty- my camera had a hard time capturing it! Now we have Beat It, from the Michael Jackson collection (which Dirty Diana was also part of)! 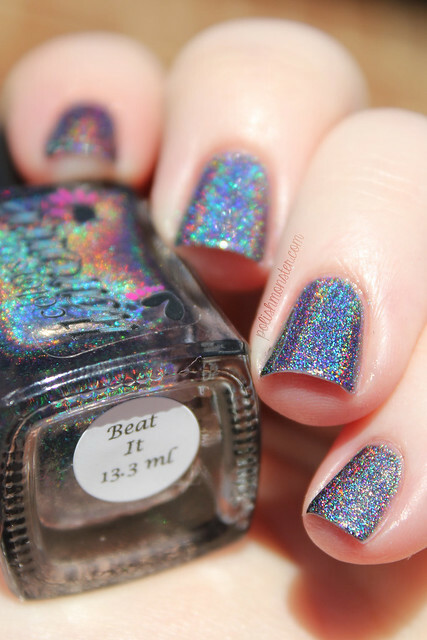 Beat It is a charcoal holographic polish with a blue flash. I’m not sure if this is retired or not- it may be. If so, I’m sorry for making you drool! Super intense linear holo, and really pretty indoors as well. Last but not least, we have Rizzo! Rizzo is a pale baby pink linear holo. It’s a bit more ‘metallic’ than some of the other polishes I showed today- it reminds me a bit of Color Club Halo-Graphic, but more baby-pinkish! But that same kind of metallic feel. This is probably the most intense holographic CbL’s I have! Valentine’s Day is one of my favorite holidays- though it has nothing to do with the romance part. One of the main colors for Valentine’s Day is PINK- how could I NOT love it?! All of the wonderful Valentine’s Day nail polish collections always contain glorious shades of pink, and it’s totally awesome! Today I’m going to be showing off one of the only ‘sets’ I have for Valentine’s Day this year- I bought plenty of individual polishes from indie brands though, which you’ll see over the next week. These beauties are the Valentine’s Day offerings from Above the Curve! 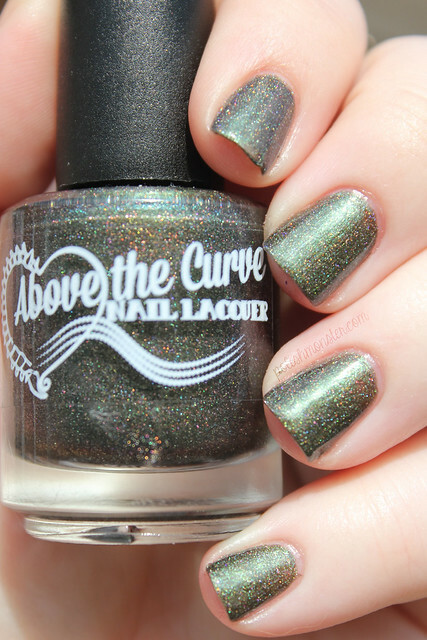 I LOVE Above the Curve- their polishes are always amazing, and Angel and Shawn (owners) are both such amazing people that I’m lucky enough to consider friends. Anywho, enough rambling- onto the pretty pictures! First we have Truly, Madly, Deeply. 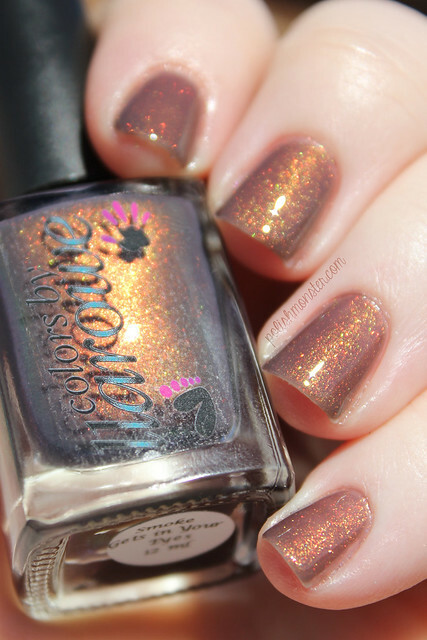 Truly, Madly, Deeply is a beautiful orchid holographic polish. Orchid seems to be quite the trend this year for Valentine’s Day collections- at least that I’ve seen! It has a pretty pink shimmer and a more subdued holographic finish. Almost metallic feeling, though it’s certainly not a metallic polish. 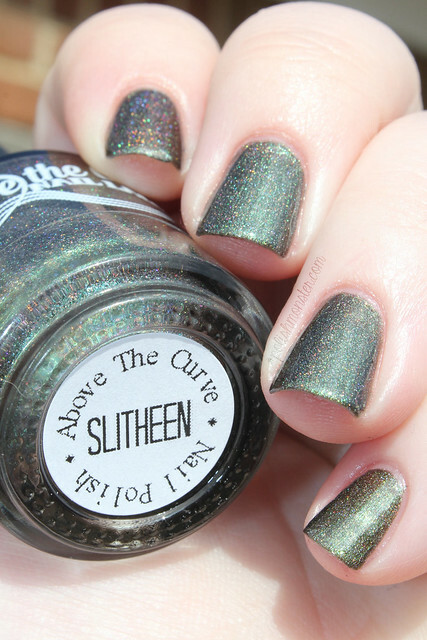 As I expect with Above the Curve polishes, application was wonderful. I used 2 coats with KBShimmer Clearly on Top topcoat for the photos shown. Next I have Circle of Love! 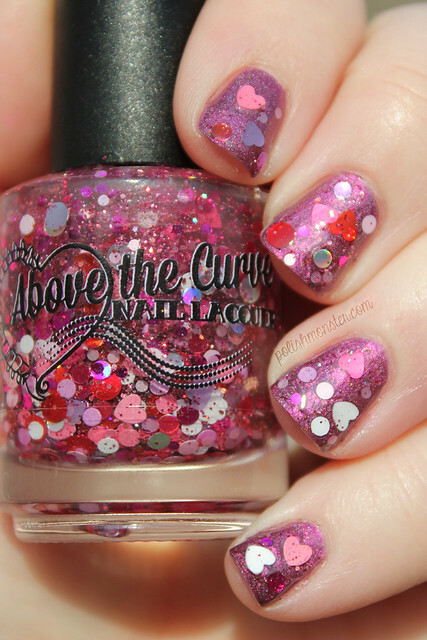 Circle of Love is a fun glitter topper, filled with TONS of circle glitter and hearts in every shade and finish of red, pink and white! This is definitely Valentine’s Day in a bottle! I didn’t have any issues with this one- I chose to dab the glitter on where I wanted it rather than paint it on, but I had no trouble at all getting hearts or circles onto the brush. I had to fish a little when I wanted something specific though 😉 Photos show 1 ‘coat’ of Circle of Love with KBShimmer Clearly On Top topcoat. Last but not least, my favorite- All You Need Is Love! WINE!!! All You Need Is Love! Wine!!! is a breathtaking polish filled with- well, TONS of things. It’s a brown/wine holographic base, filled with purple, red, copper, brown glitters, holographic glitter- it’s really amazing. The base polish is actually quite opaque, so the glitters in it peek through but aren’t super obvious. This is one of those polishes that sparkles like crazy in the sun- but is equally beautiful inside as well. 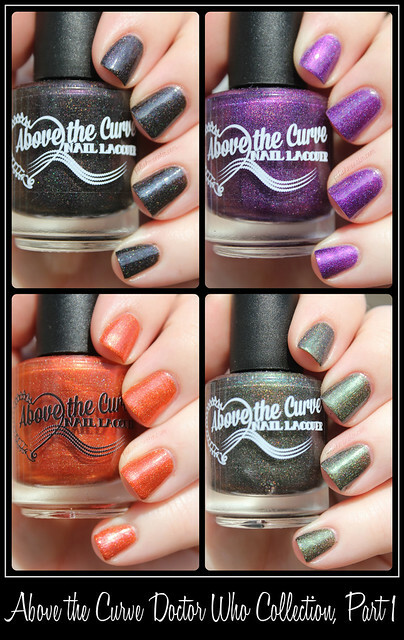 You can find Above the Curve polishes in their Big Cartel store, and also at Overall Beauty. You can follow the ATC Facebook page and ATC on Instagram for news and updates. Polishes range from $7 to $9- and don’t forget, $1 from every bottle is donated to Shriner’s Hospitals for Children!